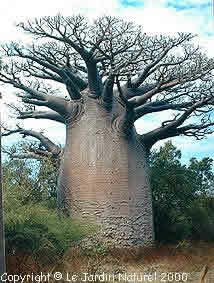 The African baobab is the most important in number and also the better known among the eight species. Indigenous in the semi arid part of the sub-Saharian Africa. It is clear that the distribution of the species throughout the dry parts of Africa is mainly due to humans. Adansonia digitata has a character which is unique in the genus: pendulous flowers. The tree is usually massive, reaching 25m in height and up to 12 m in diameter, with irregular crown. Bark grey, smoth. Some times irregurlarly tuberculate. Flowers of Adansonia digitata are white. The fruits are variable, globose to ovoid. The Australian baobab is a small (rarely taller than 10m ) irregularly shaped tree often with multiple trunks, and irregular crown. One of the six species of baobabs endemic from Madagascar, perhaps the better known of Malagasy baobabs, and for a lot of people, the most aesthetical of all baobabs. A pure gem. Often represented on the front cover of books dealing with Madagascar. The crown is at the top of the tree and flat; the branches are regurlarly distributed, mainly horizontal. Flowers are white, yellowing whith age. Fruits are subglobose to ovoid with a reddish indumentum. The pericarp is thin and fragile. Found in dry or moist forest in the Mahajanga province and also in the North. Small to large baobabs (5 to 20m) with variable shapes of trunks from bottle to cylindrical and irregular crown. Fruits globose to subglobose, small (almost 10-15 cm long) and broad. Indumentum brown and sparse. 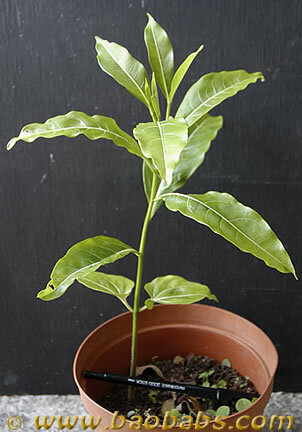 IMPORTANT NOTE: Most of the seeds of Adansonia madagascariensis proposed for sale on the web ARE NOT Adansonia madagascariensis but Adansonia grandidieri... 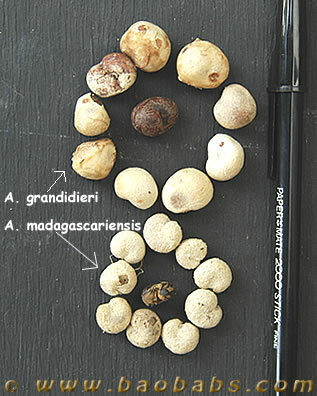 This is due to a confusion: The seeds are collected in the habitat from a group of Adansonia grandidieri which are located in the south of Madagascar and unknown as grandidieri so confused with A.madagascariensis. This confusion is also due to the fact that the shapes of the fruits of A.madagascariensis are similar to those of A.grandidieri. - A.madagascariensis: cotyledons are large, thin and flat. 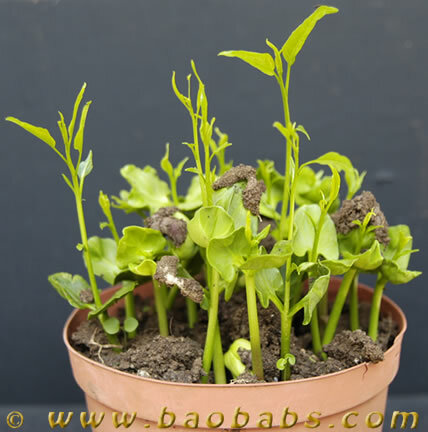 First leaves are generally long and simple, with a shiny deep green color, and new leaves often stay simple for many months. We are proud to offer to our customers seeds of verified species, this for all species that we propose for sale on our web site. The "smallest" baobab of Madagascar. Usually small (4-5m) but can reach 20m sometimes. The trunk is bottle shaped with a distinct constriction beneath the branches. Bark is usually redish brown when mature, but grey and rugous when young. Easily recognizable when young by the serrate leaves. Flowers bright yellow to orange yellow. Fruits globose, with a dense reddish indumentum. Perhaps the most endangered species of baobab. Less than 10 populations are actually known. Restricted to the North of Madagascar near Antsiranana. Medium to tall trees up to 30m. Irregular crowns with thick branches, often ascending at 45°. Flowers pale yellow to yellow orange. It can be considered as an endangered species of baobab. Large trees up to 25m tall and 2m in diameter. Trunks single, often tapering from bottom to top. Crown flat-topped, branches regularly distibuted and mainly horizontal. The most widespread baobab of Madagascar, occuring in south, west and northwest. 5 to 30m tall, usually single trunk, cylindrical or slightly tapering and swelling. Primary branches often tapering and ascending. Fruit ovoid or oblong, 10 to 30cm, usually black.